A HERVEY Bay man is dead after yet another horror car crash on the region's roads. The 86-year-old was driving northbound on Netherby Rd at Gundiah when his sedan collided with a four-wheel drive towing a caravan heading south 1.5km south of Tiaro. He was pronounced dead at the scene while paramedics worked to cut his partner from the buckled wreck. 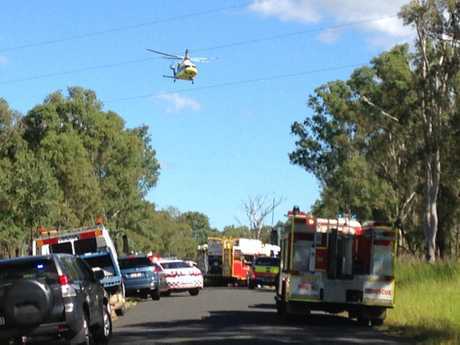 The woman, 84, was airlifted to the Sunshine Coast Hospital with non-life threatening injuries. The passengers in the four-wheel drive, believed to be from the Sunshine Coast, were shaken but uninjured. Netherby Rd was closed to all traffic for several hours while the Forensic Crash Unit investigated the scene. Superintendent Mark Stiles said the crash happened about 10.30am yesterday. 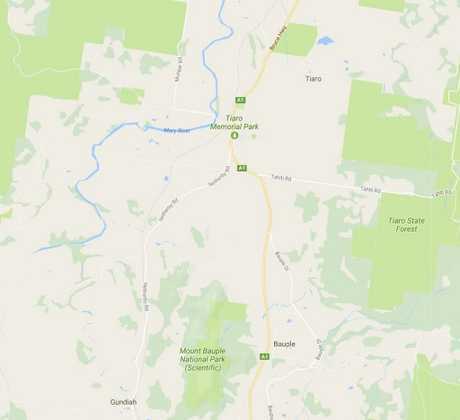 The couple in the Toyota Landcruiser were towing a caravan southwards towards Gundiah. The deceased man and his passenger were believed to be heading home to Hervey Bay. The collision caused only minor damage to the Landcruiser but the caravan rolled in a roadside drain and was extensively damaged. The victims' car was crushed and its major parts strewn across the road. The crash impact appeared to have spun the smaller vehicle 180 degrees. Supt Stiles said the police Forensic Crash Unit was investigating and would prepare a report for the coroner, but he urged all drivers to take care, even in fine conditions. POLICE have confirmed an elderly man who died in a Tiaro crash and an elderly woman who was airlifted to hospital were from Hervey Bay. Initial reports that the couple was from Gympie were incorrect but local police at the scene said the couple were well-known to them. 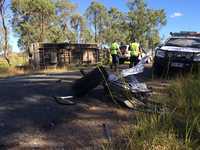 The Queensland police said initial information suggests a sedan was travelling northbound on Netherby Rd when it crashed into a four-wheel-drive towing a caravan heading south 1.5km south of Tiaro. The 86-year-old male driver of the sedan was pronounced deceased at the scene. The 84-year-old female passenger in the sedan was airlifted to Sunshine Coast Hospital in a stable condition with non-life threatening injuries. A man and woman in the four-wheel-drive did not sustain any physical injuries. The Forensic Crash Unit is investigating. A WELL-KNOWN local couple is believed to be involved in the fatal crash at Tiaro this morning that has left one man dead and an elderly woman seriously injured. 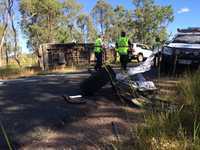 The couple were believed to be travelling in a sedan when it was involved in a crash with a Landcruiser towing a caravan, heading south out of Tiaro at the time of the crash around 11am. The two people in the Landcruiser are believed to have only minor injuries. The crash occurred 200m from the Bruce Hwy turnoff on a straight stretch of single lane bitumen road that has no line markings on it. The elderly woman has been airlifted to the University of the Sunshine Coast hospital. Tiaro fatal crash: A man has been killed and a woman injured in a crash near Tiaro. A RESCUE helicopter is about to leave the scene of a fatal crash with an elderly female patient who was trapped in a vehicle. State police, local police and the local police inspector are on the site of the deadly crash, involving a a car and a car towing a caravan, where it is confirmed a man died and another two people suffered minor injuries. Netherby Rd remains closed to all traffic. A MAN is confirmed dead and an elderly woman is trapped in a vehicle following a tragic crash near Tiaro this morning. 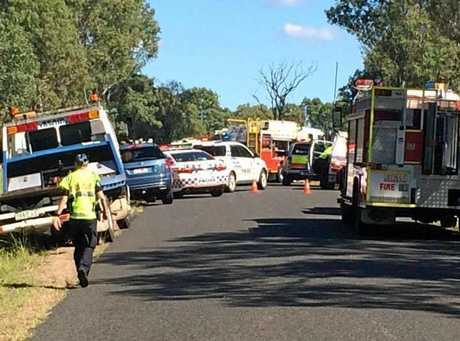 The crash involved a car and another vehicle towing a caravan that overturned down a ditch at the corner of Redbank Rd and Netherby Rd, just off the Bruce Hwy south west of Tiaro. Two other patients have minor injuries, while the elderly woman remains encapsulated. The Lifeflight Rescue helicopter has been dispatched to the scene. Netherby Rd is closed to all traffic.